Cody’s impatient for Spencer Pickett’s family to move in with his grandma, GG; as readers of the series’ first installment know, waiting isn’t Cody’s strong suit. On the Picketts’ arrival, surprises ensue (Spencer plays the violin) as well as mysteries: GG’s duplex unit is full of Picketts (Spencer’s parents are launching a business), but apart from the name “Meen” on the mailbox, the adjacent unit looks empty. When ant-fancier Cody’s stung by a yellow jacket, Mr. Meen appears with a remedy—he’s an exterminator! Unlike their dad, the Meen girls aren’t friendly, and Molly forbids Cody and Spencer to play in the backyard. 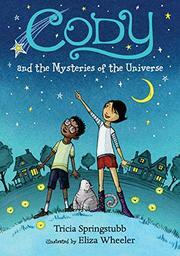 Cody tries to mentor Spencer, who’s younger, but the teacher she warned him about (the Spindle) likes him—Cody finds them listening to Mozart during recess. Cody’s classmate Pearl makes origami animals for Spencer and plays piano; soon they’re rehearsing for a concert. Do they like each other better than they like Cody? Are the Meen girls bullies or friend material? Her big brother is there for Cody, when not romantically preoccupied, but her restless, inventive mind and kind heart are her best resources. The African-American Picketts are middle-class, while, like the Meens, Cody’s family is more blue-collar (Dad drives a truck; Mom works in retail) and white. Asian-American Pearl, with her origami and music, hews rather too closely to stereotype. Understated illustrations subtly reinforce these diverse identities and bring the cozy world to life.